Cutting Hedge™ lawn care and lawn maintenance, Surrey lawn care services and regular lawn mowing. Cutting Hedge includes scarification, aeration, top dressing and our 6 month slow release fertilizer preparing the lawn to look its best during all seasons. Cutting Hedge commercial garden maintenance team focus on keeping all commercial garden lawns looking perfect, this helps companies keep a professional and neat appearance. 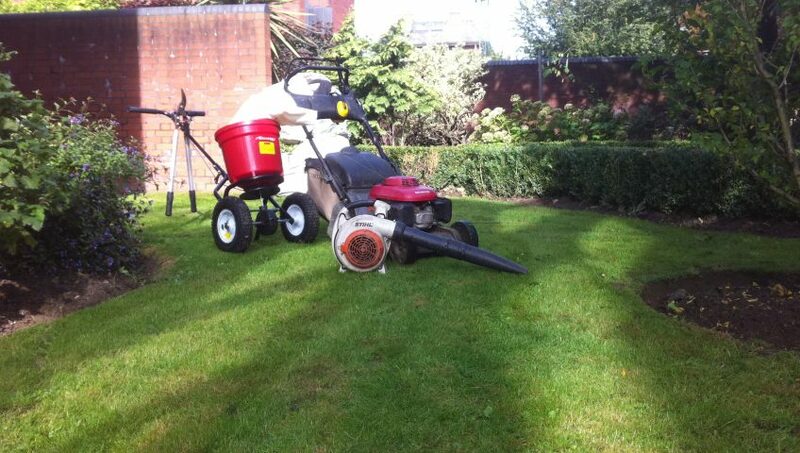 After scarification we can feed your lawn with our specialist six month feed for general purpose, hard wearing lawns. Ideal for lawns where a rotary mower is used. Choose added Sulphur to help ensure that all the nutrients are made available to the grass, particularly if your lawn is on alkaline soils (chalk & limestone) or your grass is looking a little yellow in colour. Cutting Hedge Surrey lawn feed will continue to keep your lawn in tip-top condition for six months during the stressful winter months. Analysis: NPK 15: 5: 22: plus trace elements. Treatment Area: 1 kilo covers 28sq mts / 34sq yds. Specialist six month feed for general purpose, hard-wearing lawns. Ideal for lawns where a rotary mower is used. Just apply and forget – there is no risk of burning, scorching, leaching and the need to water-in. Cutting Hedge spring and summer lawn care provides excellent green colour and slow continuous growth throughout the spring and summer months. Sulphur will ensure that all the nutrients are made available to the grass, particularly if your lawn is on alkaline soils (chalk & limestone) or your grass is looking a little yellow in colour. Analysis: NPK 28: 3: 10: plus trace elements. Our service is designed for all our maintenance packages or yearly, The yearly Surrey lawn care service consist of two visits. Cutting Hedge includes lawn fertilising, scarification, topdressing and aeration. We cover all Surrey including Woking, Sunningdale and Chobham.